Israel will ask President Obama to order US attack on Syria if Assad tries to transfer weapons of mass destruction to terrorists. 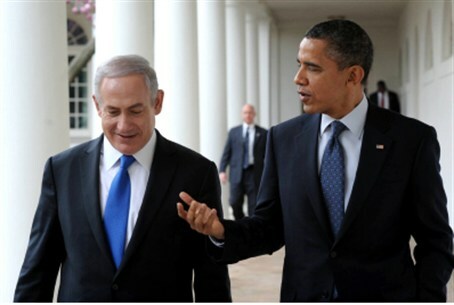 Syria promises to loom large in discussions between Prime Minister Binyamin Netanyahu and U.S. President Barack H. Obama when the latter visits Israel this week. And according to the Guardian newspaper in Britain, those discussions will entail an Israeli request for the U.S. to take military action against Syria. Israeli sources do not expect Obama to agree to the Israeli request – but the objective is not necessarily to get Obama to commit American troops to yet another imbroglio in the Middle East, but to convince him to approve an attack by Israel if Bashar al-Assad tries to transfer chemical weapons to Lebanon. The report quoted a senior Israeli source as saying that Israel preferred to take care of the problem without American intervention. “Maybe it would be better if Israel did not attack, but who else should do this,” asked the source rhetorically. “These missiles are a threat not only to to Israel,” but also to the U.S., which has the largest fleet in the Mediterranean. Obama has said that the U.S. would intervene in Syria if Assad used chemical weapons or tried then to terror groups. But Israeli sources told the Guardian that they felt that Obama would not come through at the moment of truth, and that Israel would be left to deal with the problem by itself. The sources said that they did not expect Obama to agree to commit to a Syrian attack, but they did hope to garner the President's support for an Israeli attack if one was needed.